Throughout 1929 Joaquín Torres-García, who had been living in Paris since 1926, took part in the creation of an international group of abstract artists. Taking over from Neoplasticism, this new group, definitively constituted in 1930 with the name Cercle et Carré, intended to contrast the growing influence of Surrealism. As a consequence of this project, which took up a much of his time, Torres-García met some Dutch painters who were then living in Paris, among whom were Mondrian, Vantongerloo and Van Doesburg. The influence of Neoplasticism, present in his work from that moment on, would be one of the fundamental factors in his mature artistic style, which he attained in 1930. 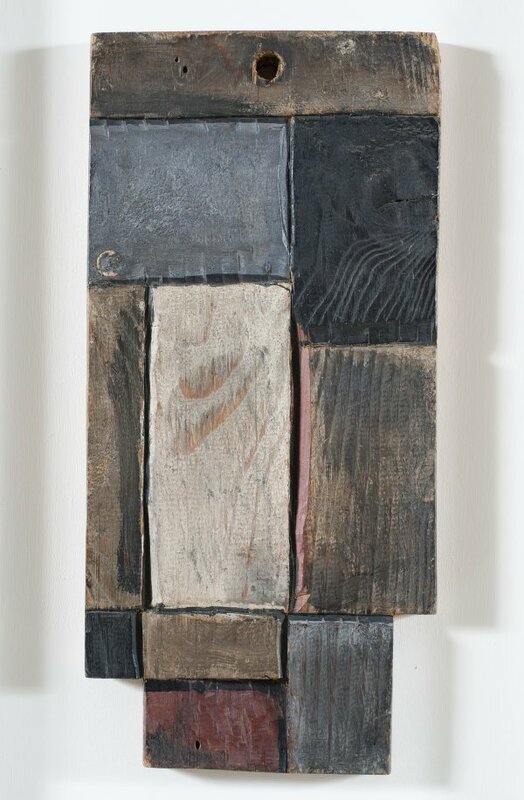 The main element Torres-García adopted from Neoplasticism was the orthogonal pattern of horizontal and vertical rectangles, an element that will remain a constant feature of his subsequent oeuvre. Other evidence of the neoplastic influence can be found in a small group of works executed around 1929, in which he experimented with basic colour planes typical of the Dutch trend. The painting we are analysing is related to this group, not only in its orthogonal pattern but also in its irregular perimeter; this can also be found in at least two other works of the same group painted, like this one, on wood. Yet in this piece Torres-García abandoned the basic colours and chose a dark palette, with very warm and subdued hues. This range of colours is precisely the most striking feature of Wood Colour Planes. Its chromatism as well as the meticulous handling of the support-carved with a gouge, tinted with very diluted oil paint, and rubbed to show the wood grain-enable us to see in this work an outstanding illustration of the process through which Torres-García moved away from Neoplasticism and adopted the trans-cultural and primitivist abstraction that characterised his mature style. Drawing for "La Catalunya eterna"